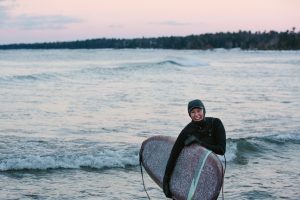 Learn to surf on Lake Michigan with Ella Skrocki, Empire’s own world-traveled wahine, and one of the Great Lake’s most passionate female surfers. Ella grew up with Lake Michigan as her playground, learned to surf on an old wind-surfing board at age 8, and has since traveled to world-class surf around the globe. When in Michigan, she surfs year-round, and has spent countless hours scouring the Great Lakes coastline for surf. She has lived on the shores of Lake Superior while going to school at Northern Michigan University, and spends every summer playing in waves in the heart of the Sleeping Bear Dunes National Lakeshore. Our 1.5 hour surf lessons are held on the shores of Lake Michigan and have an instructor to student ratio of 1:4 or less. Meet us at the shop thirty minutes before your reserved lesson time to get suited up (we rent wetsuits if needed for an additional $10), then head to the lighthouse or, in some cases, venture off to find better surf. Whether it’s wavy or glassy flat, we can have a very successful time on Lake Michigan. Great Lakes surf lessons are canceled only if there is hazardous weather on the lake. Our surfing lessons begin by squatting in the sand as you learn about the science behind Great Lakes surfing, the fundamentals of a pop-up and techniques for getting in and out of the water. All students will practice paddling and popping up on your surfboards on shore before getting in the water. Throughout the rest of the surf lesson, our highly knowledgeable surf instructors will do everything they can to get you surfing toward the shore and down the line of the Lake Michigan wave. There is always attention to each individual student and plenty of time for questions and helpful commentary, which will give you confidence to try surfing again on your own. We encourage people to take as many surfing lessons as they find necessary or are interested in. Interested in a private or advanced lesson?